2014 February | whydocatholicsdothat.com Blog– Pray. God is waiting. 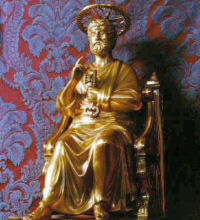 Since early times, the Roman Church has had a special commemoration of the primatial authority of St. Peter. As witness one of the most renowned of the Apostolic Fathers, the Roman See has always held a peculiar place in the affection and obedience of orthodox believers because of its “presiding in love” and service over all the Churches of God. “We shall find in the Gospel that Jesus Christ, willing to begin the mystery of unity in His Church, among all His disciples chose twelve; but that, willing to consummate the mystery of unity in the same Church, among the twelve He chose one. He called His disciples, said the Gospel; here are all; and among them He chose twelve. Here is the first separation, and the Apostles chosen. And these are the names of the twelve Apostles: the first, Simon, who is called Peter. [Mt. 10, 1-2] Here, in a second separation, St. Peter is set at the head, and called for that reason by the name of Peter, ‘which Jesus Christ,’ says St. Mark, ‘had given him,’ in order to prepare, as you will see, the work which He was proposing to raise all His building on that stone. “All this is yet but a beginning of the mystery of unity. Jesus Christ, in beginning it, still spoke to many: Go, preach; I send you [see Mt. 28, 19]. Now, when He would put the last hand to the mystery of unity, He speaks no longer to many: He marks out Peter personally, and by the new name which He has given him. It is One who speaks to one: Jesus Christ the Son of God to Simon son of Jonas; Jesus Christ, who is the true Stone, strong of Himself, to Simon, who is only the stone by the strength which Jesus Christ imparts to him. It is to him that Christ speaks, and in speaking acts on him, and stamps upon him His own immovableness. And I, He says, say to you, you are Peter; and, He adds, upon this rock I will build my Church, and, He concludes, the gates of hell shall not prevail against it. [Mt. 16, 18] To prepare him for that honor Jesus Christ, who knows that faith in Himself is the foundation of His Church, inspires Peter with a faith worthy to be the foundation of that admirable building. You are the Christ, the Son of the living God. [Mt. 16, 16] By that bold preaching of the faith he draws to himself the inviolable promise which makes him the foundation of the Church. According to the 1962 Missal of Bl. John XXIII the Extraordinary Form of the Roman Rite, today is the feast of St. Valentine. 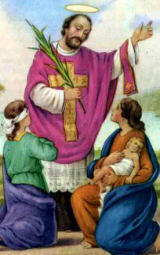 St. Valentine, a priest of Rome, was martyred, it would appear, in about 270. On the Flaminian Way, at the site of his martyrdom, Julius I built a basilica which was visited frequently. In 867 the two brothers came to Rome, were met by Pope Hadrian II (867-872) and the whole papal court. They gave a report of their labors but encountered opposition on the part of jealous clergy who took offense, it was said, because of their liturgical innovations. 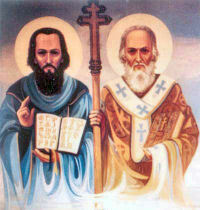 Cyril and Methodius explained their methods and from the Pope himself received episcopal consecration (868). Soon after, Cyril died at Rome, only forty-two years old, and was buried in St. Peter’s; later his body was transferred to San Clemente, where his remains still rest. His funeral resembled a triumphal procession. Symbols for St. Cyril: With Saint Methodius; Oriental monk holding a church with the help of Methodius; surrounded by Bulgarian converts; wearing a long philosopher’s coat. The valentine has become the universal symbol of friendship and affection shared each anniversary of the priest’s execution — St. Valentine’s Day. Valentine has also become the patron of engaged couples.